We are excited to share with you our 2018 summer update. Please read on for important updates on BID services, opportunities for your business, upcoming events, and staffing updates. The BID's lamppost flower baskets were filled at the beginning of the summer with colorful spring annuals. These flower baskets will be maintained through the early fall. Additionally, the BID hosted two volunteer planting days earlier this year. These community planting days included the Tishman Speyer Day of Service in June at Dutch Kills Green and the Queens Plaza bikeway/greenway, and a volunteer day with JetBlue in which beautiful begonias were planted in the tree pits on Queens Plaza. Be sure to check out all of these wonderful additions to our community! Stay tuned for a community planting volunteer day in the fall. LIC Partnership recently rolled out our new colorful banner campaign across the district. Select locations remain available and businesses can sponsor one or more banners for the year. If you have any questions about the 2018 Neighborhood Banner Campaign or how to get involved with the Partnership, please contact our Marketing & Community Coordinator, Robert Reuter at rreuter@licpartnership.org . In anticipation of the holiday season, the BID team is working on getting street light poles wired so we can install holiday lights throughout the neighborhood. We want to keep LIC looking vibrant and lively year round! NYC Love Your Local grants are open to small businesses operating for at least three years in New York City's five boroughs. NYC Love Your Local was created by the NYC Department of Small Business Services (SBS) to help local businesses continue providing the jobs, goods, and services that make our neighborhoods vibrant. Selected businesses will receive up to 20 hours of in-depth consultations from industry experts to determine how best to adapt to rising real estate costs, and up to $90,000 in grant funding to implement recommendations. Applications are open now through August 10, 2018. Learn more and apply here! The brand new Mayor's Office of Nightlife is conducting an economic impact study of nightlife to set the foundation for its work. The office is asking nightlife owner/operators and employees/artists to share their experiences and perspective through an online survey. Answers are being collected by a third-party and are anonymous. The survey should take no more than 15 minutes to complete. You can complete the survey here. Join NYC Department of Small Business Services for the start of their Fall Hurricane Preparedness Webinar Series where you can learn how to prepare yourself and your business for emergencies! From gas leaks and fires, to major storms and flooding, NYC business owners face many challenges that can impact your operations and assets. You will learn how to stay in business, protect your investments, understand how to protect your assets and navigate insurance processes. This Webinar will be held on Tuesday, August 21st from 10:00am-11:00am. You can RSVP here . The NYC Department of Small Business Services (SBS) can help you make the grade! SBS compliance consultations provide an in-depth overview of how to understand key city rules and regulations and how to avoid fines and violations that stand in the way of you receiving an A grade. SBS staff will visit your restaurant and walk you through possible violations but will never issue fines or summonses. Call 311 or visit nyc.gov/bizconsult to request a free compliance consultation. You can also preview a compliance consultation here. Was Your Business Impacted by Superstorm Sandy? goTenna is partnering with the New York City Economic Development Corporation through the RISE:NYC program to distribute FREE goTenna Mesh devices to Sandy-impacted businesses. goTenna Mesh is a useful tool during times of emergency as it allows you to communicate when there is no cell or wifi service. If you are interested in applying for the program and receiving FREE devices for you and your employees, please reach out to Kristen Cabrera at kristen@gotenna.com , or enroll in the program here. Mark your calendars! The BID Annual Meeting is set to be held on Wednesday October 10th, 2018 from 5:00pm-7:00pm at WeWork in Long Island City (27-01 Queens Plaza North, 13th Floor). Also, in order to be a voting member at the Annual Meeting, you must fill out a BID Member Registration form. Your input is very important to us, and there is no cost to register ( Note: Your registration is subject to approval as your business property must be located in the BID boundaries). Celebrate small businesses and support your neighborhood during Small Business Saturday on November 24, 2018. This annual event, founded by American Express, is embraced as part of the holiday shopping tradition as each year shoppers, businesses and public officials come together to Shop Small® and show their neighborhood pride. Show your love at small businesses near you on Saturday, Nov. 24th, and throughout the entire year and holiday season. 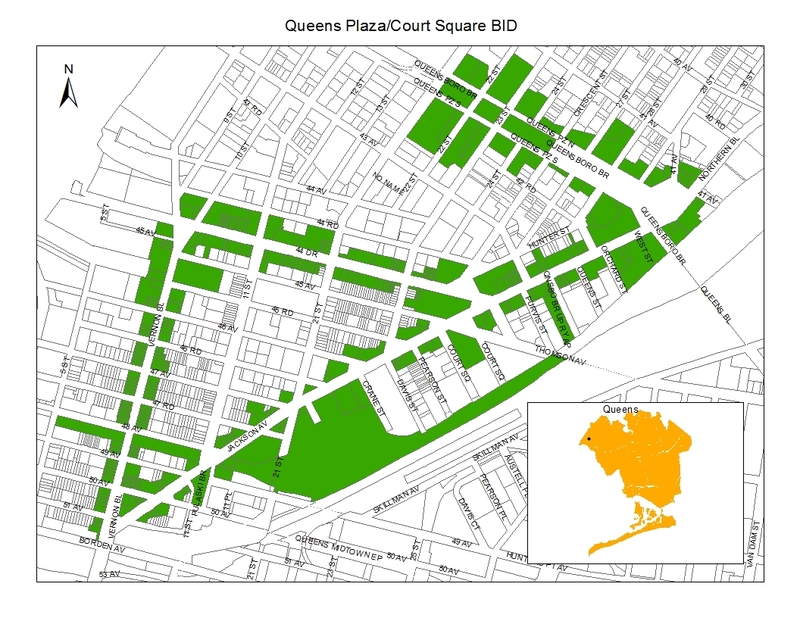 The LIC BID will serve as a Neighborhood Champion for the third year, and will be hosting a kick-off meeting for businesses a few weeks prior to the event. Stay tuned for more details to come! Is your business interested in participating in Small Business Saturday this year? If so, please contact our BID Operations Manager, Reegan Brown at rbrown@licpartnership.org. Please welcome Reegan Brown (left), who has recently joined Long Island City Partnership as BID Operations Manager. Also, as our Director of BID Field Operations Dan Benjoya is out on paternity leave for the summer, Alison Lands (middle) has been filling in as Interim Director of BID Field Operations. You can contact Reegan at rbrown@licpartnership.org and Alison at alands@licpartnership.org. We also have three students interning with us through the PENCIL program over the summer- Warisha, Joseph, and Brad (right). They have been very helpful with tracking street conditions, collecting data, and planning projects with the BID team. Be sure to say hi when you see them out in the district! As always, please let us know if we can help with any issues you're experiencing in the district. The LIC Business Assistance Team is also here to help for any questions or concerns regarding your BID business. We recently moved to a new office in our building and are now located in 27-01 Queens Plaza North, Level B. You can reach the BID team at 718-786-5300 x208.